This brings to mind that timeless line from 1991’s Jean-Claude Van Damme clunker, Double Impact. No, not “Take your fancy clothes and your black silk underwear and go back to Disneyland.” The other timeless line. 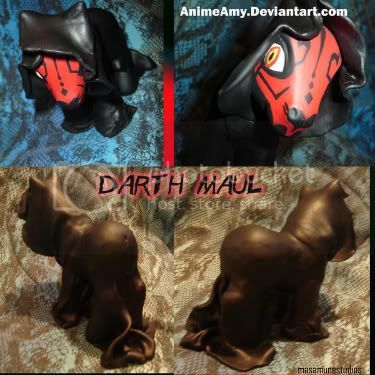 Silly me for thinking that I had discovered the sole artist sculpting My Little Pony dolls into Star Wars characters. Artist Amy (a.k.a. AnimeAmy on deviantART) has also produced quite the collection of custom My Little Ponies, in themes ranging from The Dark Knight to Halo. And also some anime stuff that makes me all furrow-browed and befuddled. But, still… lots of quality geeky icons. Including Mr. Yoda Pony, here. He came out better than I expected though. 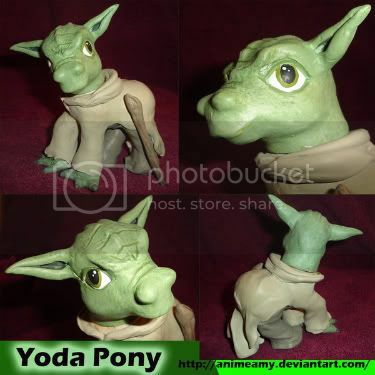 At first I wasn’t sure how well Yoda would transfer into a pony but I always love challenges and he was so much fun to make. He also won 3rd place at the custom contest for the Cincy Ohio Pony Meet. That’s right. When she’s not artist-ing My Little Star Wars Ponies, Amy’s collecting ticket stubs from the world’s most obscure genre conventions. If you missed her at the Cincy Ohio Pony Meet, you can try running into her Ohayocon, Daigacon, Acen, or Metrocon. Or Orbyubacon. Ok, I made that last one up. But did it sound so far-fetched at this point? Check out the full variety of Amy’s custom My Little Pony efforts in her deviantART gallery. Have something in mind you’d like to see? She’ll be available for commissions again in mid-2009. So I’d learn to master the fine art of thumb-twiddling if I were you. Hahahaha love it! I love when people make things out of My Little Pony. Previous post: Geek Steal: 64% off The Wire Complete Series!